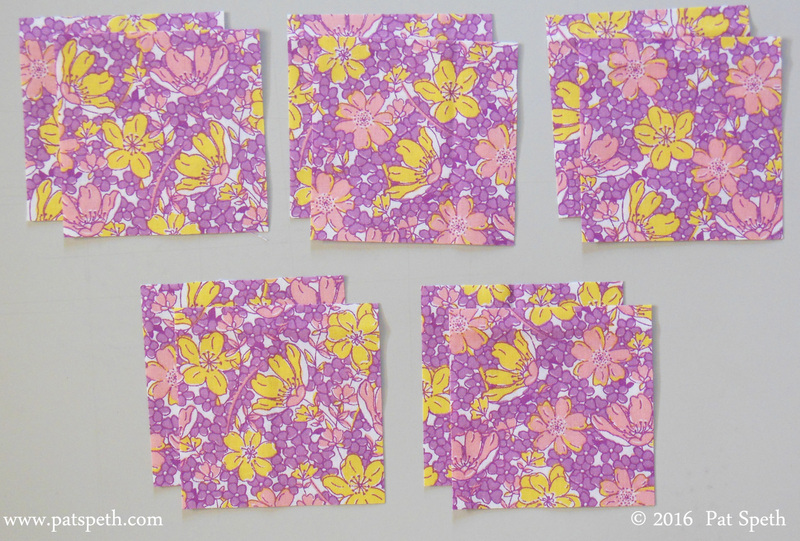 Day 4 of the Ruby’s Treasures Blog Hop! The Ruby’s Treasures fabric collection was created by Barb Eikmeier and Paintbrush Studio to celebrate 100 years of Ruby Short McKim. In 1916 Ruby’s first quilt pattern was published by the Kansas City Star newspaper launching her career as a quilt designer. Throughout the 20s and early 30s she published numerous patterns but only one book: One Hundred and One Patchwork Patterns. 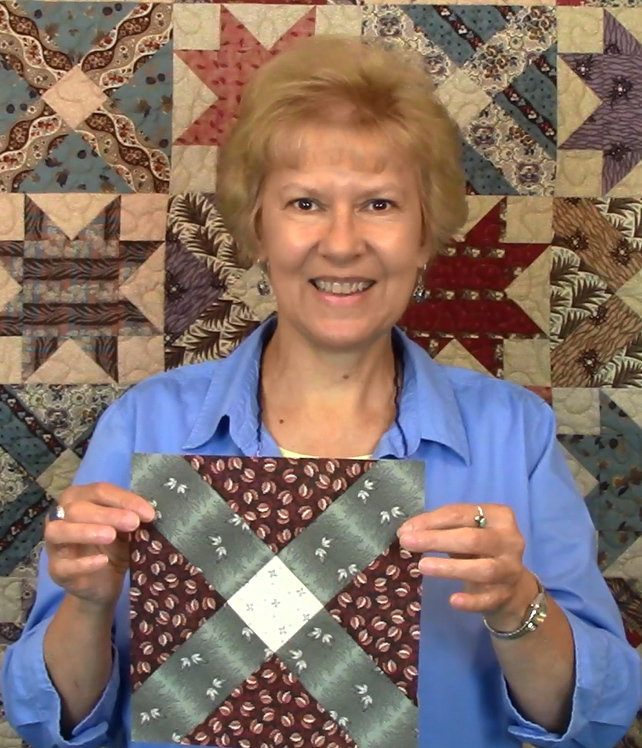 Hop around and collect all 6 tutorials to make a 12 block quilt. Leave a comment at each stop to be entered to win great prizes! 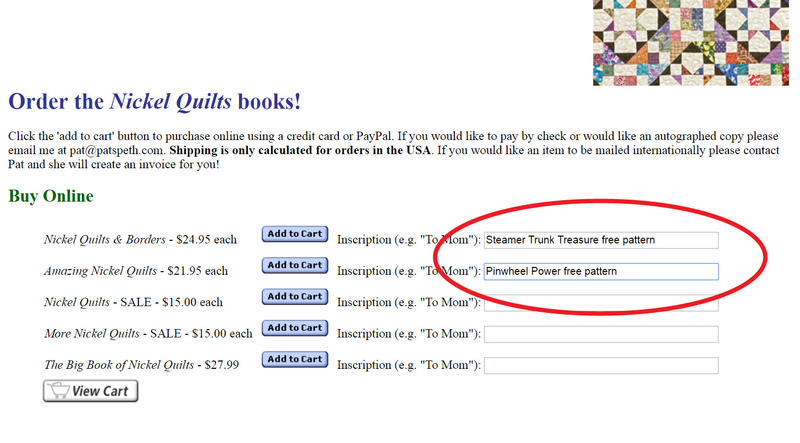 Paintbrush Studio has a giveaway of Ruby’s Treasures FQ bundles for each day of the hop. To be eligible for the giveaway, go to Inspired by Fabric and sign up to follow the Inspired by Fabric blog, either by email or blog reader, then come back to this blog and leave a comment letting me know that you are signed up to follow. 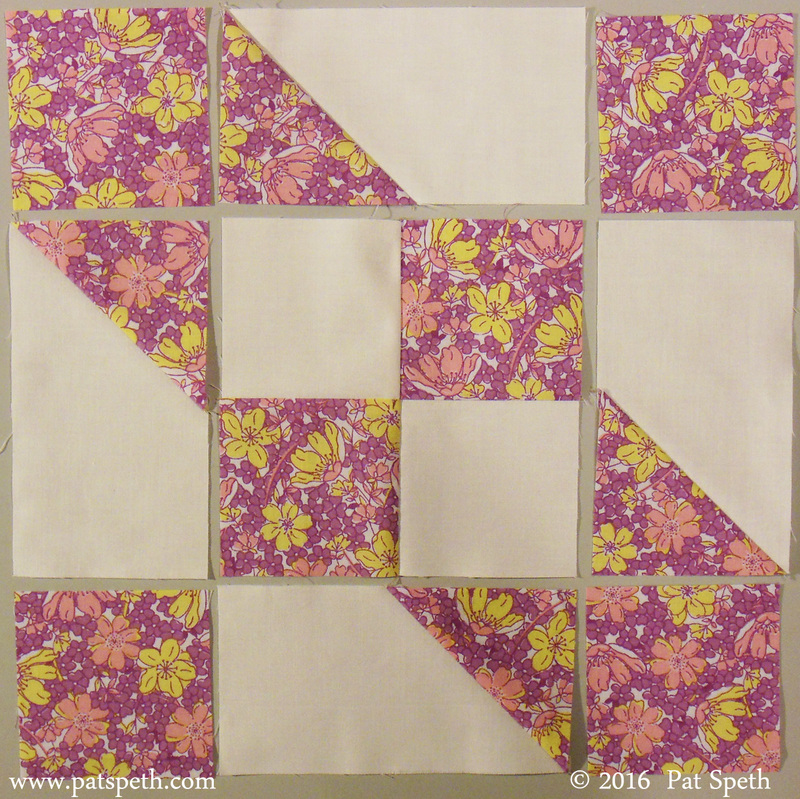 I was asked to participate in this blog hop by choosing one of Ruby’s blocks and make it as a 12″ block, then share a tutorial making the block in two different color ways, using, of course, the Vintage 30s Ruby’s Treasures fabric collection. 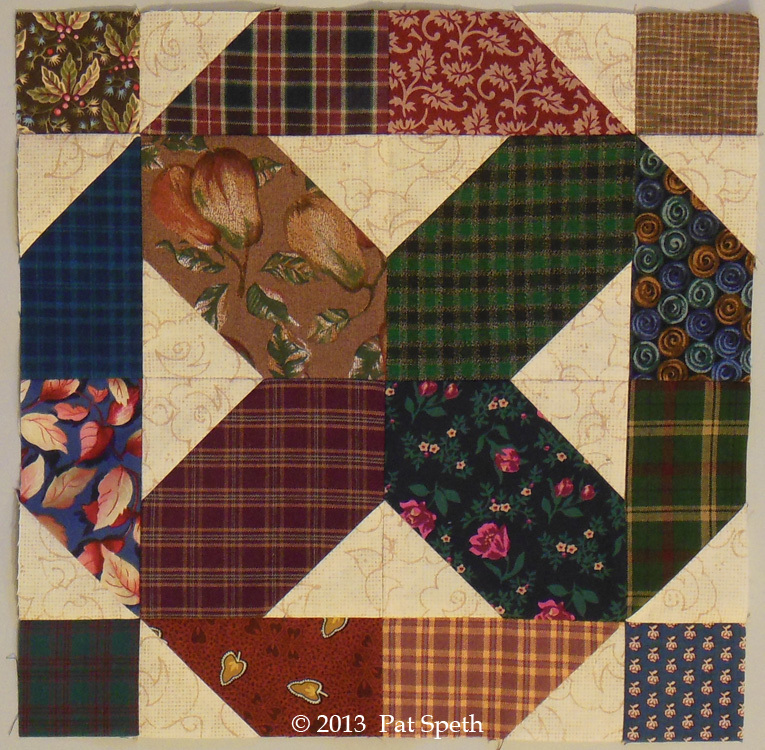 I chose the Road to Oklahoma block to make. For my first color way I went with just one main fabric along with the background fabric. For those of you who know me, you know I love scrappy quilts and might have as many as seven or eight different fabrics in a block like this. 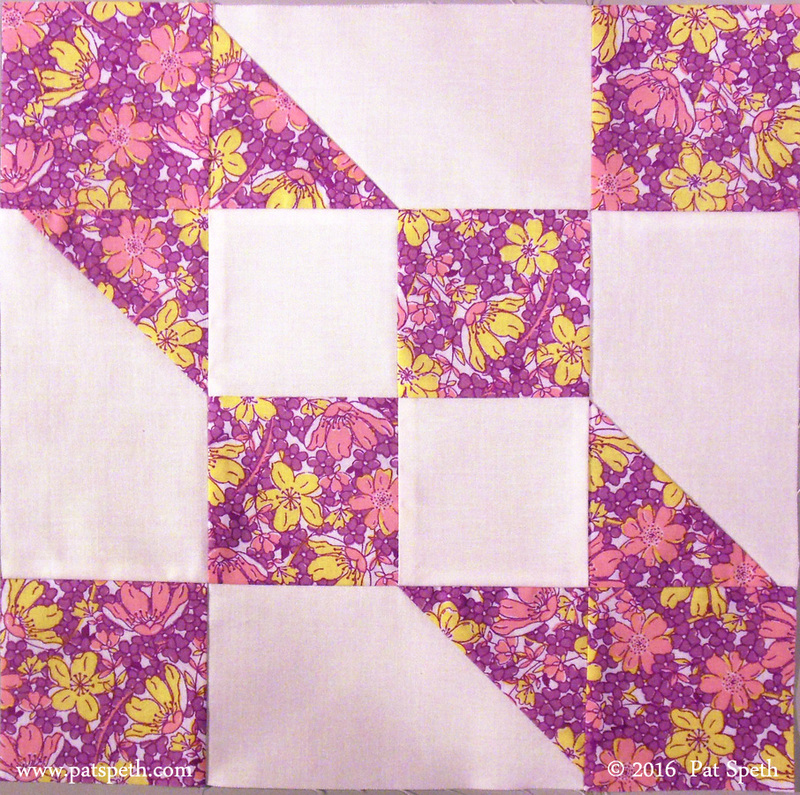 But this block in this size would be perfect for a beginner quilter and many beginner quilters as well as other quilters are not always comfortable making really scrappy quilts. 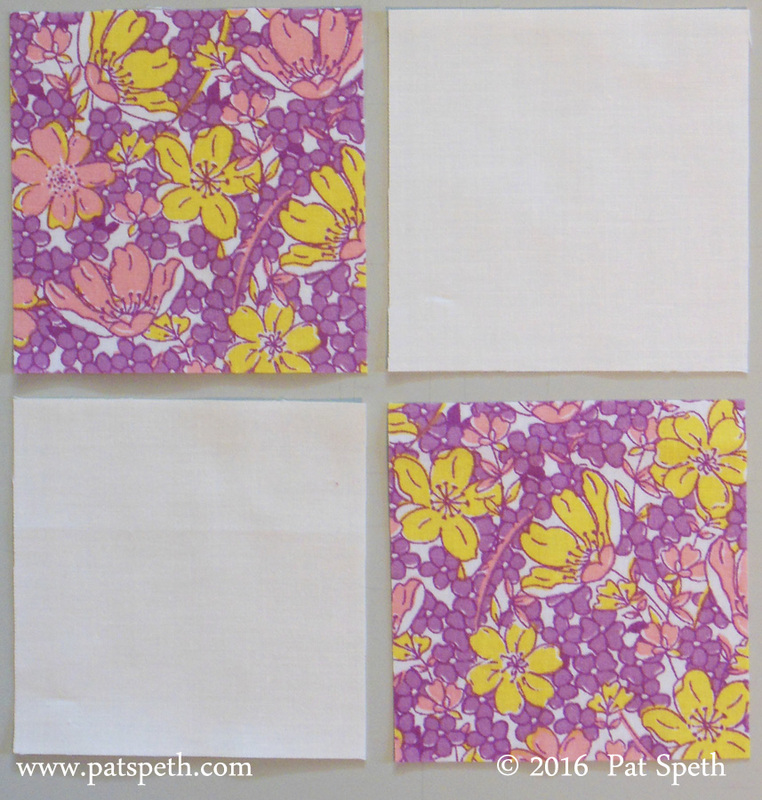 This could be a fun and easy introduction into scrap quilting by making each block out of different fabric from the collection and then enjoy arranging them in to a quilt top. For my second color way I’m using two main fabrics along with the background fabric. 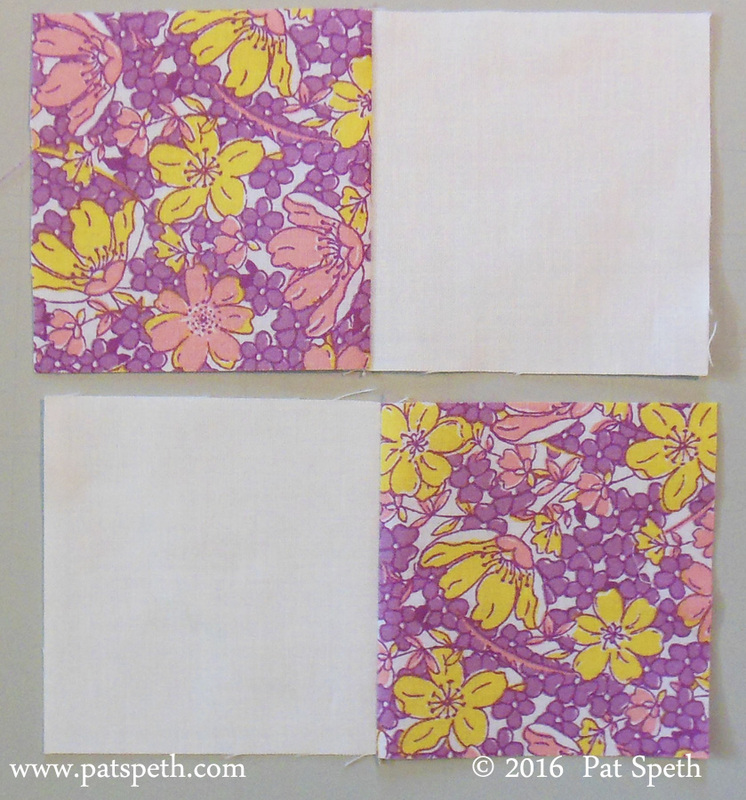 Picking two fabrics for the block that I decided worked nicely together. Step 1. 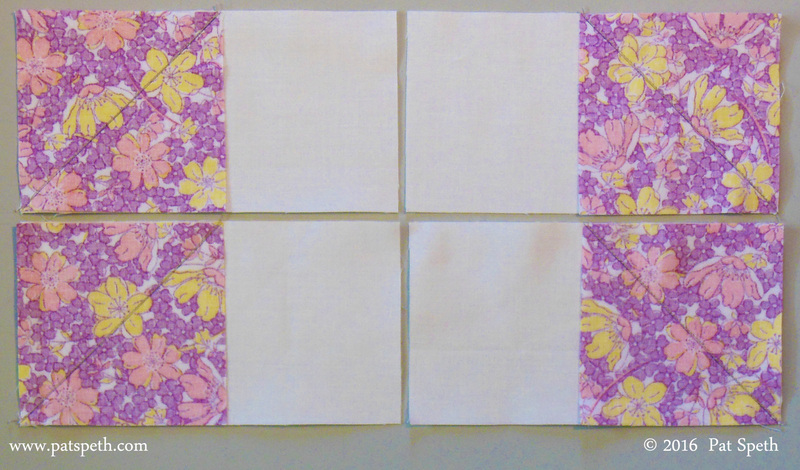 We are sewing connecting corners, so on the wrong side of four main fabric squares, draw diagonal lines from point to point. Step 2. We are making what I refer to as “Picket Fence” units. We are making mirror image units. For two of the units; with right sides together, place a marked square at the left edge of a background rectangle. For the remaining two units; place the marked squares at the right edges of a background rectangles. Stitch one thread width to the outside of the diagonal line (towards the corner you are going to cut away). A close up showing detail of what I mean by, “stitch one thread width to the outside of the diagonal line, towards the corner you are cutting away”. This also shows my stitching for the waste triangles I like to utilize. 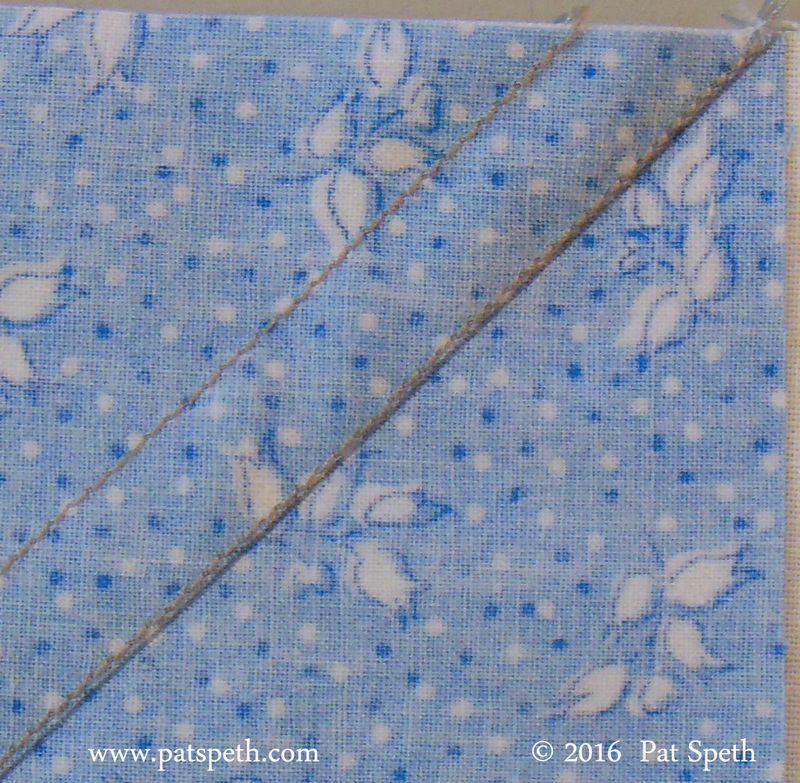 I sew this second line of stitching somewhere between 3/8″ – 1/2″ away from the original diagonal seam. This close up is from a unit that has a square added to the left edge of the rectangles. Step 3. 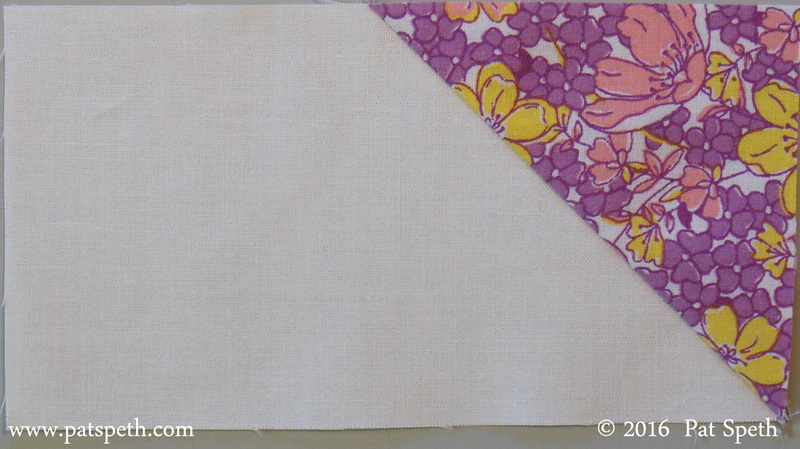 Fold back the fabric towards the triangle and check the alignment of the triangle with the edge of the square. After the alignment has been checked trim away the waste triangle units and press towards the triangle. Step 4. 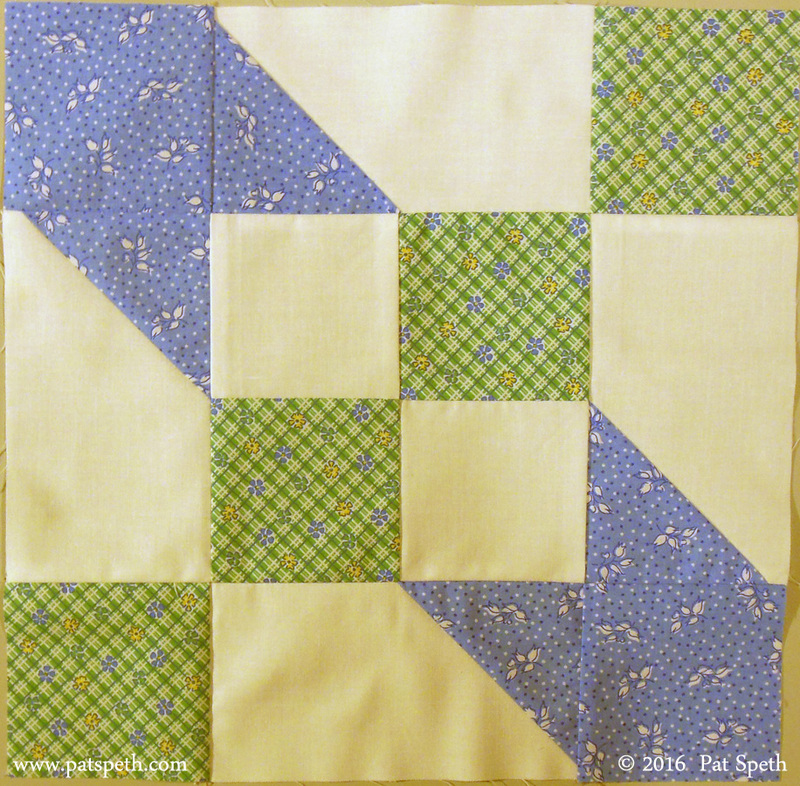 Make the center four patch from two background squares and two main fabric squares. Arrange the squares as shown below. 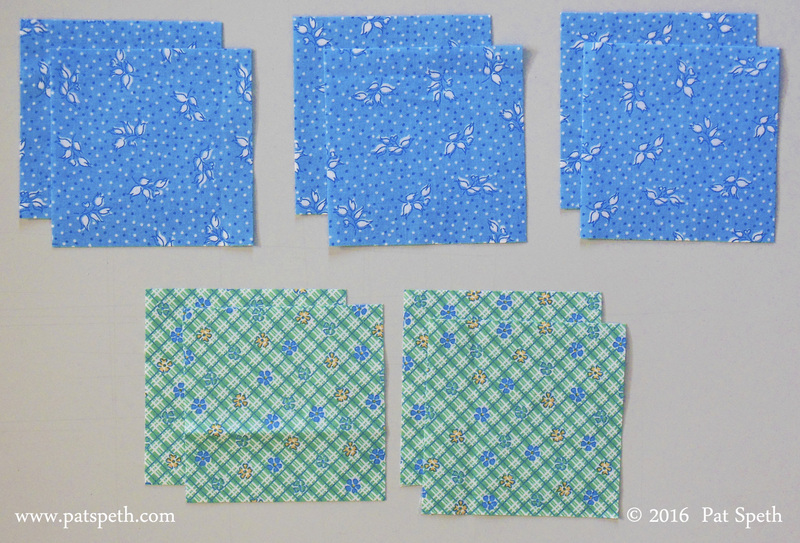 Sew the pieces in the top row together. Sew the pieces in the bottom row together. Press towards the dark. Sew the two rows together and press in any direction you like. Step 5. Arrange the picket fence units, the four patch, and the remaining squares together following the diagram below. 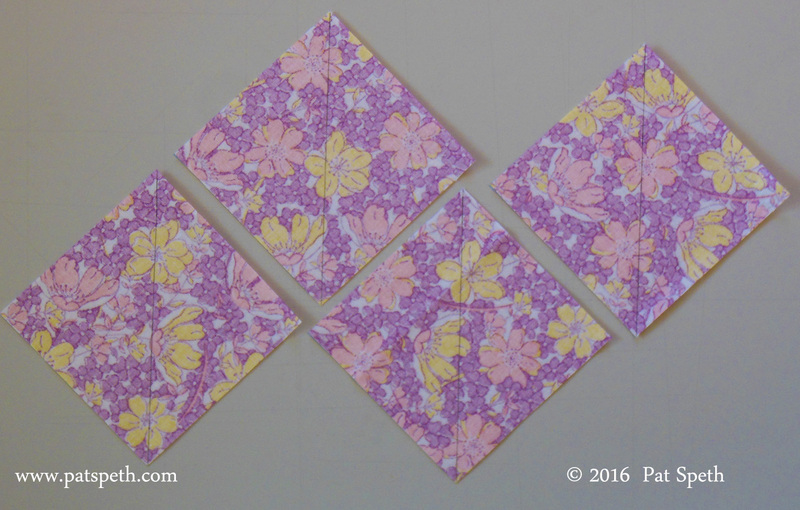 Sew the units and pieces together into three rows. 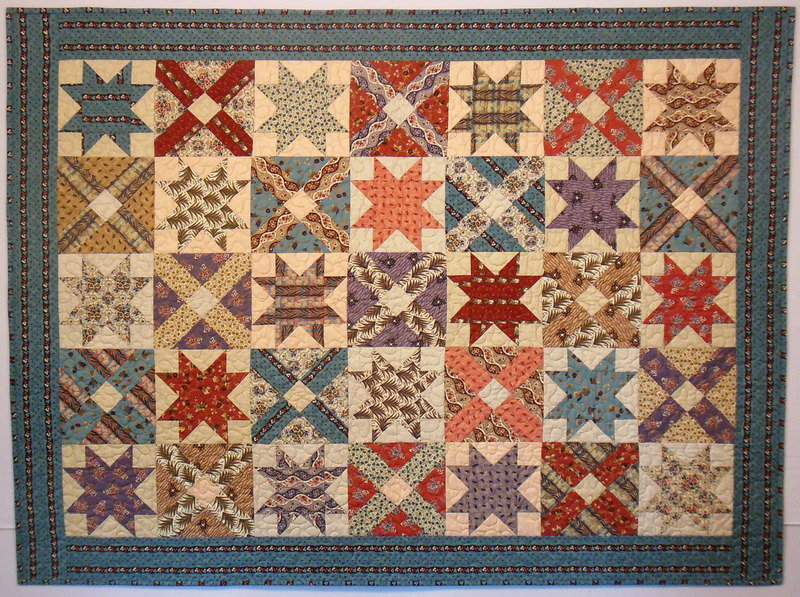 I pressed the seams in the top and bottom rows towards the 3 1/2″ squares, and the seams in the center portion of the block towards the center four patch. 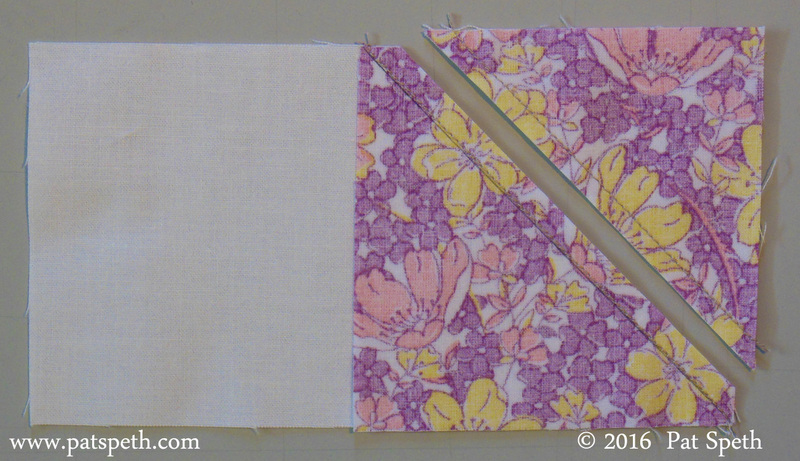 Sew the rows together to complete the block, press the seams in any direction you like. The block should measure 12 1/2″ at this point and will finish at 12″. 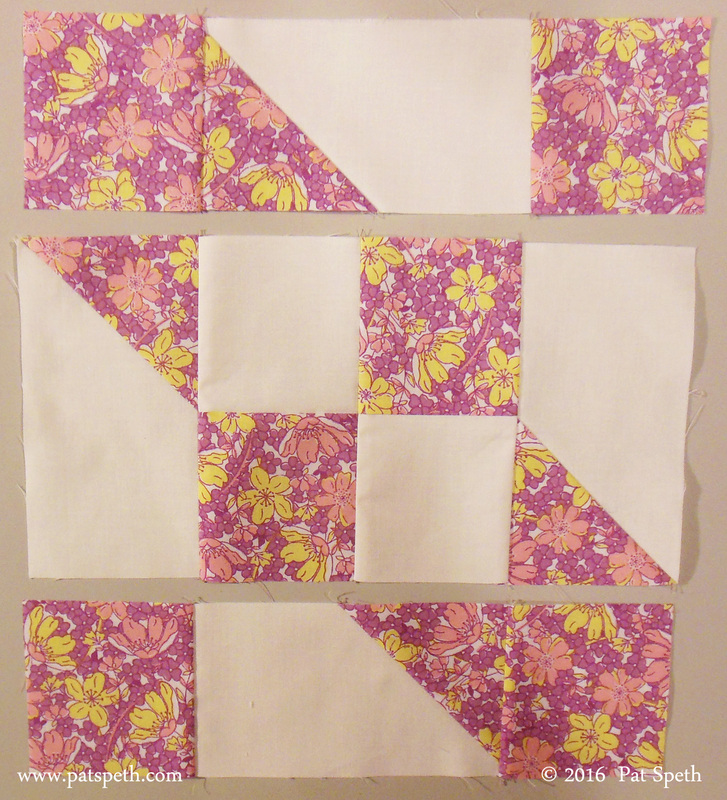 Here is block number # 2 of the Deli Geese Block Project! Since the Deli Geese method makes Top Units and Bottom Units, I’ll be working in sets of two for the blocks. Block #1 Scarlett used Top Units and Block #2 Rhett is using the Bottom Units from the same Dark Flying Geese. Details on making the units are found here. 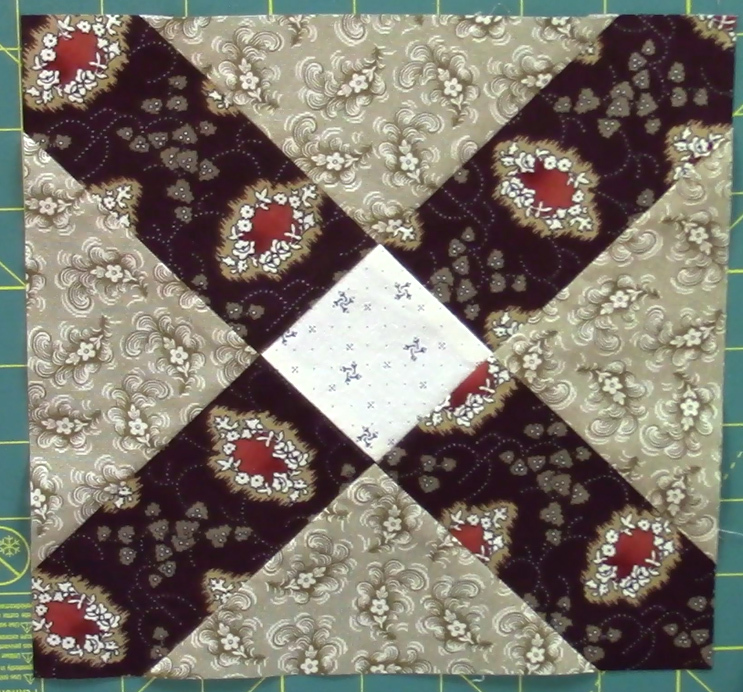 In the basic unit image I will not be showing a center seam even though I have one in the actual block, this is because the large Flying Geese can be constructed from larger squares which eliminate the need for the center seam and I don’t want to have to remember which image to show! So the above image is the generic image I will be using for the Bottom Unit no matter what method I choose to use. 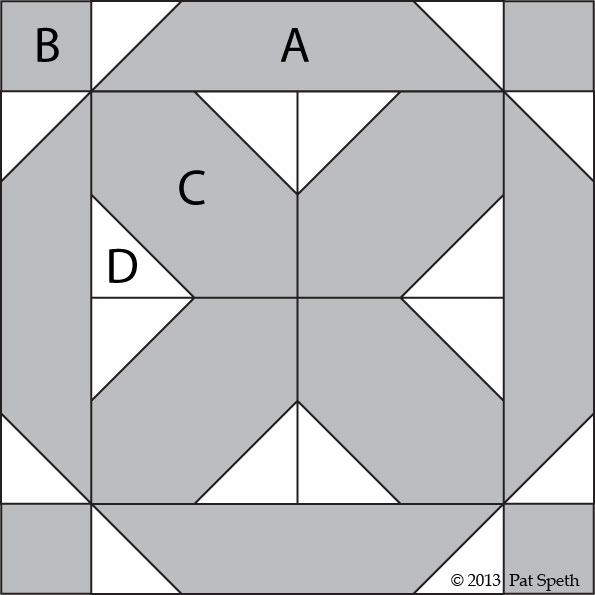 D – eight 2 1/2″ squares added to C with the connecting corner method that can be seen here.